Would you like to become a Recommended Business? If you are dedicated to providing excellent service and would like to showcase your business to other independent business owners, here is how it works. If you would like to become a BOSS Recommended Business, please feel out this short application form with some basic details. Please tick as many as apply to your business. This will be used on the summary and listings pages before visitors click through to your dedicated business page. It can be as simple as your elevator pitch or web page introduction. This will be showcased on your Business Page and is a chance to talk about your specific services, products, offers and anything else that you think would be useful for potential clients / customers to know. No more than 500 words please. Please provide a short recommendation / review (max 100 words) along with their name, email address and / or phone number. Biz Tips articles are requested to be 100-400 words with an accompanying image. You will be name-checked, with a link through to your company listing. Posts and tips can be submitted at any time, and will also be pushed out on social media. Is there anything else that you'd like to include, or questions that you'd like to ask? Thanks for getting in touch! We'll review this asap and get back to you. In the meantime, please send over the information in Step 2 to hello@b-oss.com.au. Once you have completed the application form, please make sure that you send us the additional information that we need to complete your listing. As a group of recommended businesses, we are more powerful than a single voice. 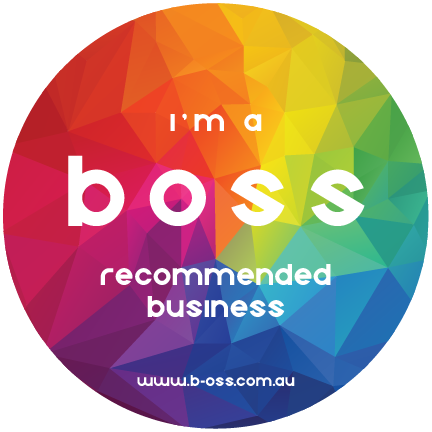 Spread the word that you are a BOSS Recommended Business, and stand out from the crowd.